Surabaya Bromo Ijen Crater Blue Fire Tour 3 Days 2 Nights. Traveling to Indonesia for a trip to Surabaya Mount Bromo Ijen Tour Package which ends at the port (take the ferry to Bali) or return to Surabaya (airport or train station or hotel). Bromo Ijen tour package is one of the popular tour packages in East Java Indonesia. The first activity was to visit Mount Bromo with a beautiful sunrise and a view of Bromo crater and then see the blue fire phenomenon, green lake and mining activities in Ijen Crater with a duration of 3 days 2 nights. Bromo Ijen Tour Crater Tour Package 3 Days 2 Nights , Tour Package organized starting point pick up from surabaya airport, train station,hotel, to visit mount bromo in first day and then to ijen crater in last day or could be otherwise. After finished mount bromo ijen trip back to Surabaya or transfer to Ketapang harbour or Bali. Mount Bromo is located in East Java, one of the best destination for sunrise views and enjoys a vast expanse of sea of sand, watching the splendor of Mount Semeru, which reaches reaching the sky, and stare at the beauty of the Sun went out of the combination or otherwise enjoying the twilight of the race is an experience that will not be forgotten when visiting Bromo. Ijen crater have a blue lake. Not only that, ijen plateau or Ijen Volcano have the “Blue Fire” or “Blue Flame” there are only 2 in the world which one in Iceland. To see the blue flame at ijen crater should come in the morning precisely at dawn or travelers can depart from the hotel to the starting point at approximately 1 am. Travelers will climb 3 km is not it and they will come down to the crater, the road to the bottom of the crater are very steep and hard is around 250 meters. 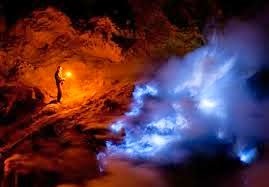 Ijen blue flame amazing natural phenomenon. Blue flame at Ijen volcano is unique, rare, and becoming an attraction itself. It also adds to the beauty of Ijen Crater the after sunrise. Bromo Tour Package started at 3.30 am the jeep 4WD will bring you to the world’s most famous view point at Mount pananjakan on the rim of the Tengger caldera to see sunrise with its young volcanic including Mount Bromo and an active Mount Semeru in the back ground is breathtaking the play light shadow with sunrise reach Mountain succession from the top to the bottom and the usual fog of the caldera. Afterward the adventure be continued to an active Mount Bromo volcano by horse riding. About at 08:00 Finished Mount Bromo Tour Package, the 4 WD will bring you back to the hotel for breakfast, take shower, packing, loading bags, to the vehicle then transfer out to Bondowoso or Banyuwangi where Ijen Crater / Kawah Ijen located. We will drive from Mt. Bromo to Ijen Crater for about 5-6 hours including stop on the way for having lunch at local restaurant. Upon arrival in Hotel, you will stay overnight and take a rest. Around 00:30 in the midnight, Our driver will bring us to the paltuding post and then continue trekking to the slope of Mount Ijen, passing through plantations and rainforest. This is one of the few remaining on the Island of Java with giant ferns, plants &amp; big trees, this journey takes approximately 1 hour from the hotel in Banyuwangi or 45 minutes from hotel in sempol Bondowoso by private car. Arrive at the parking area (Paltuding Post) of Mount Ijen, approximately 1 hour until 1.5 hours will be required to ascend slope of mount Ijen to reach peak of Ijen Crater and along the path, you will enjoy the stunning natural scenery with fresh air &amp; shady. And enjoy best panorama of the ijen blue fire dan lake of sulphate and the sulfur mining workers go down into the crater and climb back up by passing dangerous path on the edge of Ijen Crater with the load as much as 80 kilograms on their shoulders. This is really a dangerous hard job. After enjoyed the natural scenery at Crater of Ijen and then descend the slope of Mount Ijen until vehicles parking area where our vehicle is waiting for transfer out to Surabaya,Ketapang Harbour or Bali.And after arrival in Surabaya,Ketapang Harbour or Bali the mount bromo ijen crater tour package adventure ended. Mount Bromo Ijen Crater Tour From Surabaya City Center For 3 Days 2 Nights,Mount Bromo And Ijen Crater with Blue Fire or Blue Flame is the best destinations to visit natural tourist sites active volcano in East Java Indonesia. surabayabromotour.com offers convenience for those of you who want to visit both places of the volcano.